Juice sewing at 3 yrs old on his first sewing machine. Well, the little guy is 6 years old now. He has outgrown his first sewing machine and that one now belongs to his sister, 4 yr old, Allie. He had been saving money for a new machine after he got a taste of my Juki F600. When I taught him how with just the touch of a button the needle could go up and down and how he could use the automatic thread cutter on the heel of the foot pedal he was blown away! At that moment he decided he wanted to buy one for himself. He started saving. Well the most affordable version of my Juki F600 is the entry level model, F300. They are the exact same machine with a few differences- no extension table, less decorative stitches, etc. We decided to gift it to him this past Christmas and although it’s not the typical machine you would buy a small child because the price point is at almost $600 we knew he would put it to good use, take care of it and he’s just a great kid so we splurged. I was laughing to myself because I was almost 30 years old when I could afford a fancy machine like the one he got at age 6! I filmed the whole surprise and unboxing of the machine and when I find some time to edit the video I will be sure to share it with you. It’s adorable. So here’s how his latest project began. 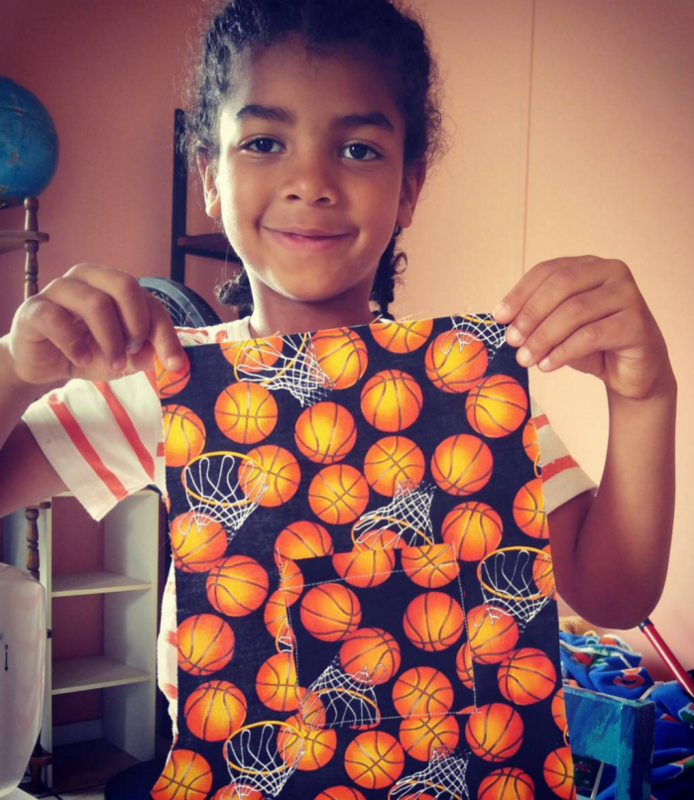 I brought him back this basketball print fabric from a recent trip and as soon as he saw it he wanted to make some shorts with it. 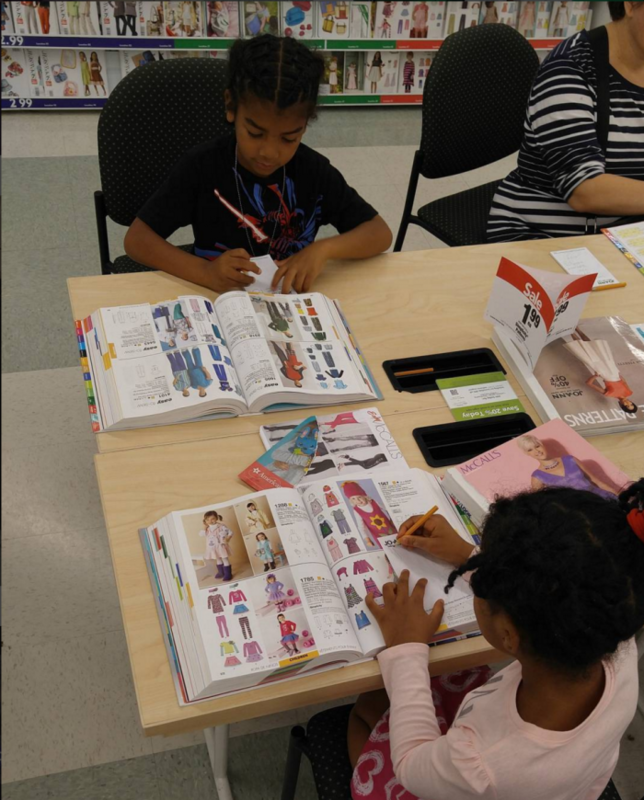 So, we headed out to our local Joann’s fabrics store where the Simplicity Patterns were on sale and I sat both kids down with their own catalog and they got to pick what designs they liked, write down the pattern number and then I showed them the categorical system and how to find each one. It was such a fun trip for all of us! 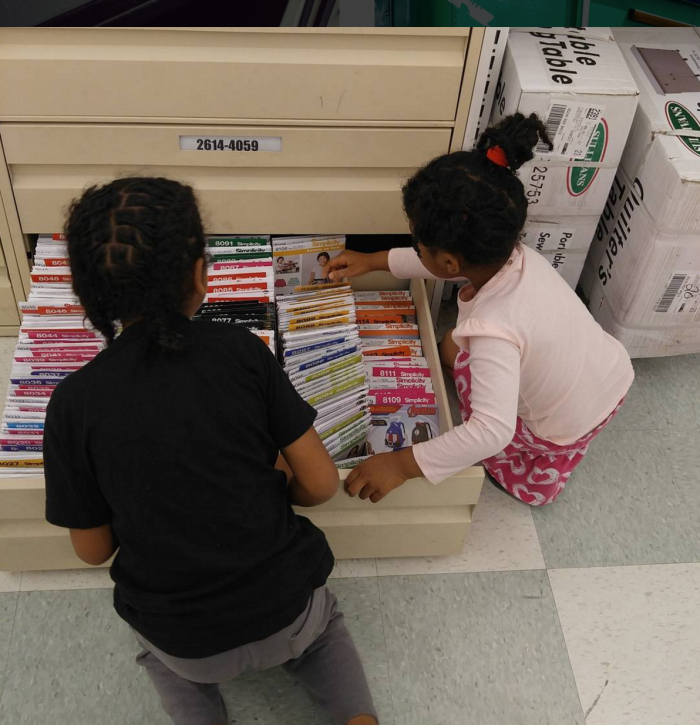 Both kids picking out their patterns. Teamwork trying to find the correct patterns from their lists. He decided on the shorts from Simplicity pattern #2318. They were a simple pair of knee length shorts that had two pockets and a simple elastic waistband. He sews near perfect straight lines these days so I thought this would be a good way to introduce some curves and new techniques like sewing on patch pockets and making an elastic casing. 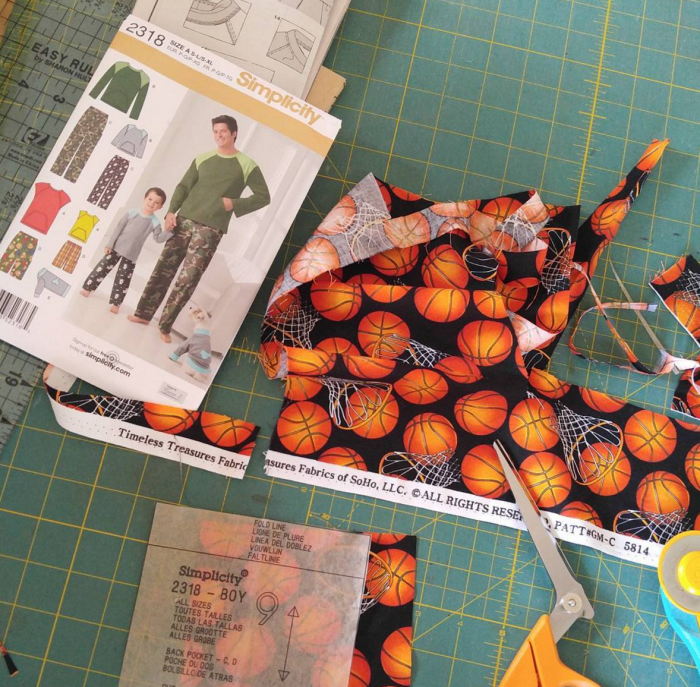 I began by showing him how many different pattern pieces are included in the envelope, then how to determine which pieces we needed to make the shorts, how to figure out which size we needed to cut out, etc. 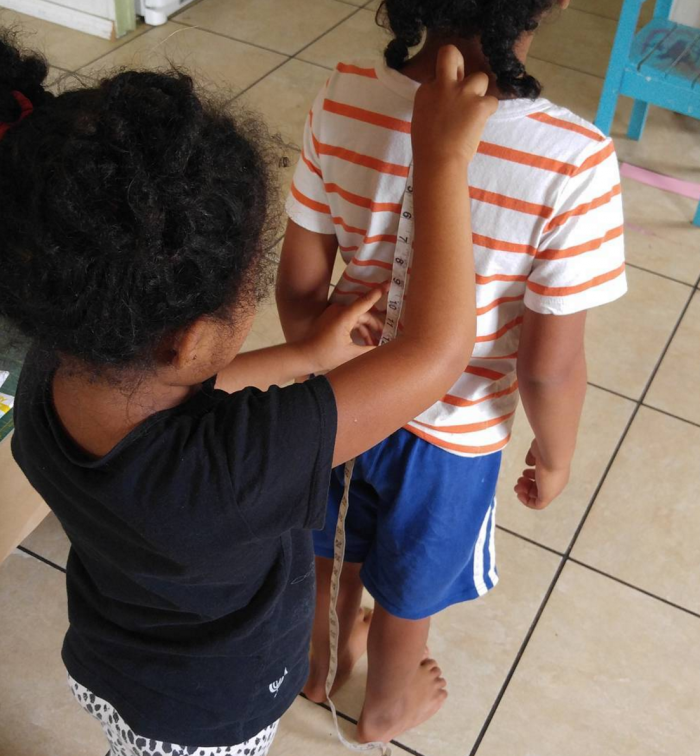 I even had them take some basic measurements of each other so they understood the importance or proper measurements when making custom clothes. I had him cut the pattern pieces from the main tissue paper sheet and then we jumped right in! Allie (4 yrs old) measuring Juice (6 yrs old). Juice cutting out his pattern pieces. 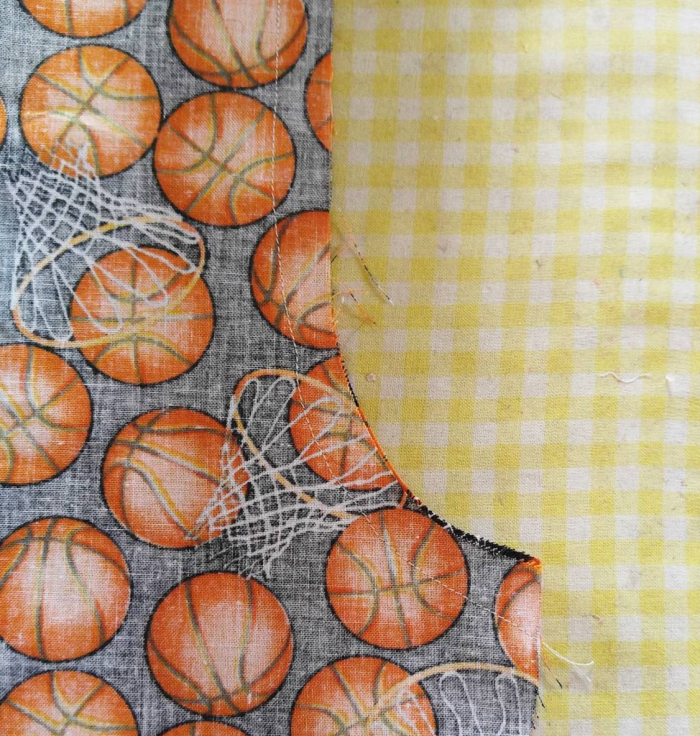 Super cute basketball print by Timeless Treasures Fabrics and Simplicity pattern #2318. Juice’s first curved seam at 6 yrs old. I noticed he was getting more and more excited as the process went along. When he sewed the first pocket on and could slip his hand in it it was like the shorts were starting to come together before his very eyes. He was lovin’ it! Here is a short video clip of him sewing up a second pocket on his new sewing machine. He is such a little pro! The project came together pretty easily for him since he is so careful and has great attention to detail. The one hurdle was that waistband casing! It took some serious pinning on my part to get the casing just right enough for him to sew it up alone but we did it! I even taught him how to feed the elastic through with a safety pin. He was so proud of himself! But not nearly as proud as my husband and I are of him! Once he tried them on he says, “Mama, now I can wear these to a basketball game and when people ask me if I bought these cool shorts I can say, ‘No. I made them! '” I’m glad he already knows how gratifying it is to make something himself! 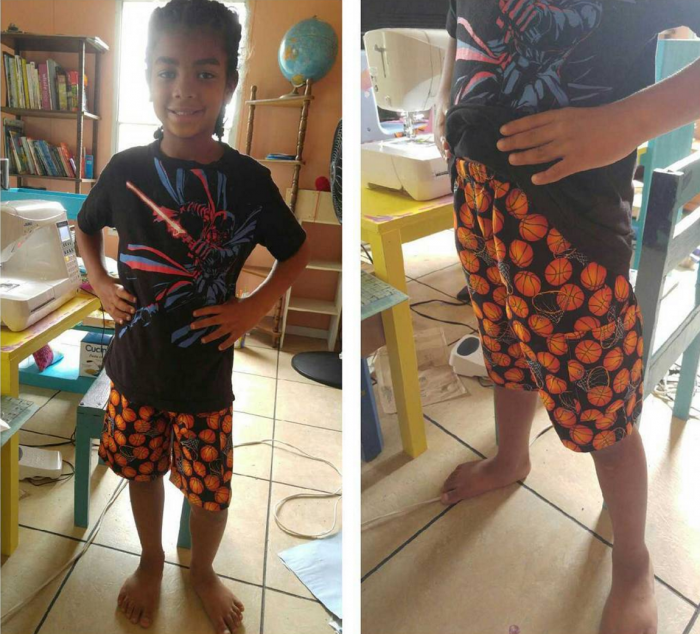 He loved the fit of the shorts so now that he sees how perfectly he can make his clothing he wants dozens of them! He is long and slim and pants either fit him too short or too wide and slide off his hips. 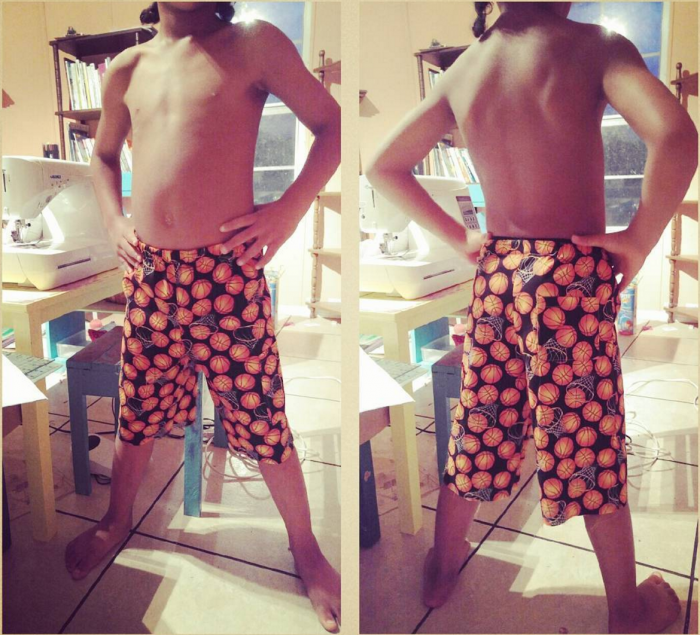 Now he can make his own cool shorts and pants to fit his body just right. We left the hemming for the next day and he did that nice and evenly by himself with no problem too. Juice hemming his new pair of basketball shorts! And here is the final product. As you can imagine he wants to wear them every single day. They have been washed quite a bit already so, I guess I need to get to cutting some more fabric so he can make at least a few more pairs. Ha! It really is amazing how much children are capable of doing if we just encourage and support them in whatever they express an interest in. Something tells me he will be a busy little sewing bee this summer. Stay tuned for more of Juice’s projects! Juice made his first pair of real shorts at age 6! 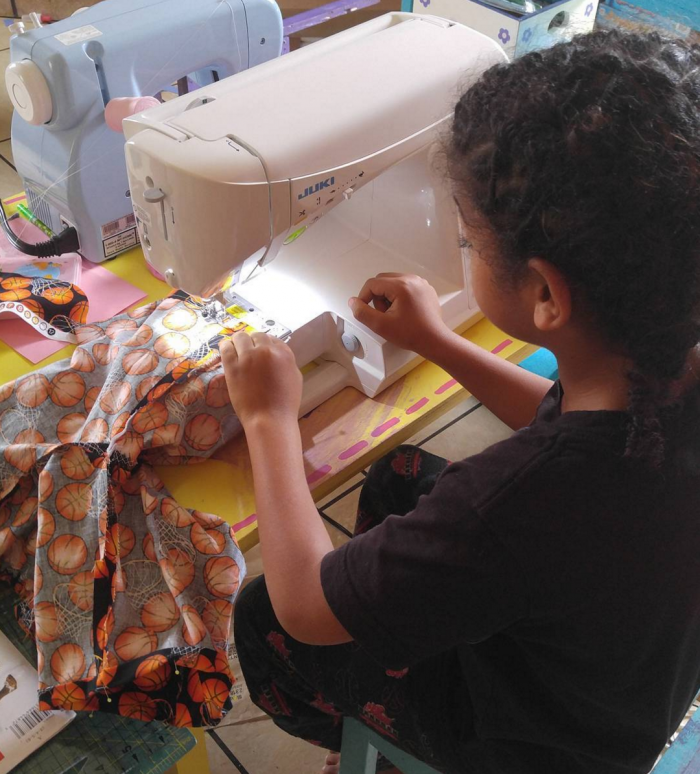 Have you taught a child in your life how to sew? Tell me about it in the comments below! You must be SO proud. I’m proud and he’s not even mine! He did a great job and I think I need to pick up this pattern so I can make my son a pair. I enjoy your family activities. This was cute! Way to go! Now he needs custom sewing labels with his name! I encouraged my boys to sew. I bought a used Singer that was theirs to use so we could all so at the same time. They made large floor pillows with corduroy and denim remnants, small hand-painted throw pillows, and even tried hand embroidery. They still have the pillows and use them (now 30 and 34.) The older one is encouraging his wife to use the old Bernina sewing machine I gave her, to shorten pants (she is a dwarf!) I have helped her make a simple fleece quilt, and helped her repair a facing that was coming apart on a dress. It is very gratifying to share the love of sewing with someone and see the “light bulb” go on. I have taught my now 7 year old granddaughter to sew, thanks to you! Last summer I bought her a little Janome, per your previous recommendation, and she loves it! She’s made a long skirt, two pillowcases, a thread catcher of her own design, and a tumbler quilt row. Her WIP’s include (yes, I am raising her to be a true sewist!) a mug rug, a patchwork heart, a short skirt and a quilt row of squares (some donated by the lqs that put her at their machine last summer). Plans for Spring Break include a fabric carrot (pattern and fabric donated by another LQS that has her on their FB), some handwork, and something from her most recent remnant choice in purple (she has not yet designed it) and a bag from Pikachu fabric. She’s been choosing fabric and designing garments for me to make her since preschool. Tell Juice I love his stylin’ board shorts! I make them for my grandsons in TNMT, Avengers, Paw Patrol, Batman, Spiderman, Minions, and Star Wars. Great job, Girl! My five (grown) sons all know how to sew as well! He is putting me to shame! Haha! I tried sewing clothing as a teenager and couldn’t get the hang of it, so I sew quilts, bags, and zipper pouches. But, now I am tempted to try this, especially since it is impossible to find shorts that go past the knees for my tall, thin, 14-year-old son. The size that does go past his knees won’t even cinch up tight enough in the waist (well, without looking completely ridiculous)! Maybe I could even sew my own scrub tops….thanks for the inspiration! ~ My son took Home Ec in the Middle School where he learned how to sew. Now as an adult, he does all the sewing and mending for his family. His wife can’t sew a stitch. I’m so proud of him! i taught my 3 year old granddaughter to sew by putting the foot pedal on the table for her to push. a year later, i had her on my lap sewing with me while i pushed the pedal. now that she is 8, she does both at the same time! she sewed a quilt for her little brother when he was born and presented it to him (and mom) in a very proud moment for all of us. This is wonderful. I’ve always said boys need to learn to sew and girls should know how to change a tire. Wonderful job. I am teaching my grandchildren also and it is going pretty good. Thank you for all your tutorials etc. love them. Such an awesome family!! It is so exciting to see Juice and Allie learning such an important and FUN skill. My sons all sewed…not my daughter! Now my granddaughter has her first machine, and my great granddaughter, 9, is starting to sew and I am so excited!! Thank you for sharing your family with us. BTW, love that you are homeschooling…two of my kids were homeschooled, all my grand kids, and starting the greats on homeschooling!! That’s more than wonderful/great for for a 6 years old!!! There is lot of talent in him! I remember when I did my first pair of shorts, I was 8 years old, I did them without patterns just from my imagination and they turnout without seams in the center! But I worn them for years with long shirt, so no one knows…LOL! My grandmother taught me to sew by hand first then on her singer treadle machine. My mom worked as a seamstress. Now I’m teaching my 11 year old granddaughter to hand sew first then use my sewing machine. She has a big interest in sewing but it’s difficult teaching a left handed kid to hand sew straight even stitches! She wants to make clothes for her #Lammily doll like I do! That’s awesome. And he’s a handsome dude! Good job, Juice. What a wonderful project! My 2 1/2 year old grandson loves to sit on my lap and watch the needle move as I sew. Your blog has encouraged me to teach him a little about what I am doing (he is a bit of a character in that he understands a lot of what I say to him). You are such an inspiration to me , Vanessa! Please tell Juice that his shorts look just perfect!! I think you have created a sewing monster–lol. Wouldn’t it be something if he grew to become a fashion designer known all around the world? I love how you guided them through the process of choosing a pattern and the measuring technique. Thank you for sharing this great event. 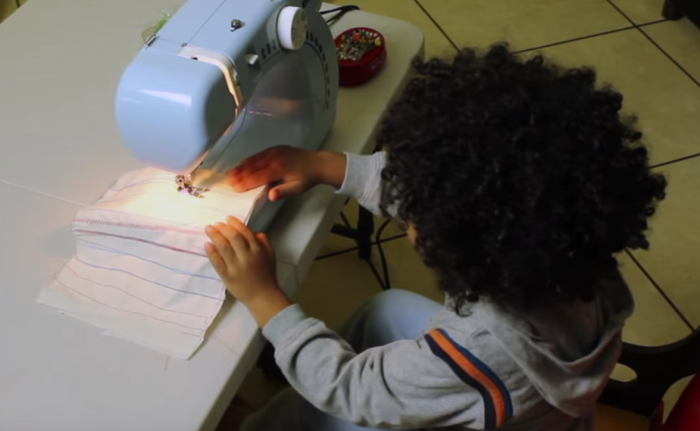 I recently showed the video of Juice learning to sew to my 13-14 year old middle schoolers. Over the years I have heard LOTS of complaints about how HARD sewing is. I tell them it is like playing basketball or any sport. You have to practice to get better and you can’t give up. When your little guy put the bobbin in the machine on his own, there were some red faces from those who find this a struggle. We are starting shorts today. I plan to show them the pictures of 6 year old Juice making shorts. I hope he will be an inspiration! It’s so amazing to see very young children sewing on a sewing machine. I started sewing by hand at a young age, my Mom taught me. Now at the age of 74, I have 3 sewing machine, and one of them is computerized. You must be so proud of your children. They are so amazing! What cool kids you have. Mine too sew but they are teenagerstill now. But if they want to fix/sew it’s great knowing they can. Love the fabric . So cute! 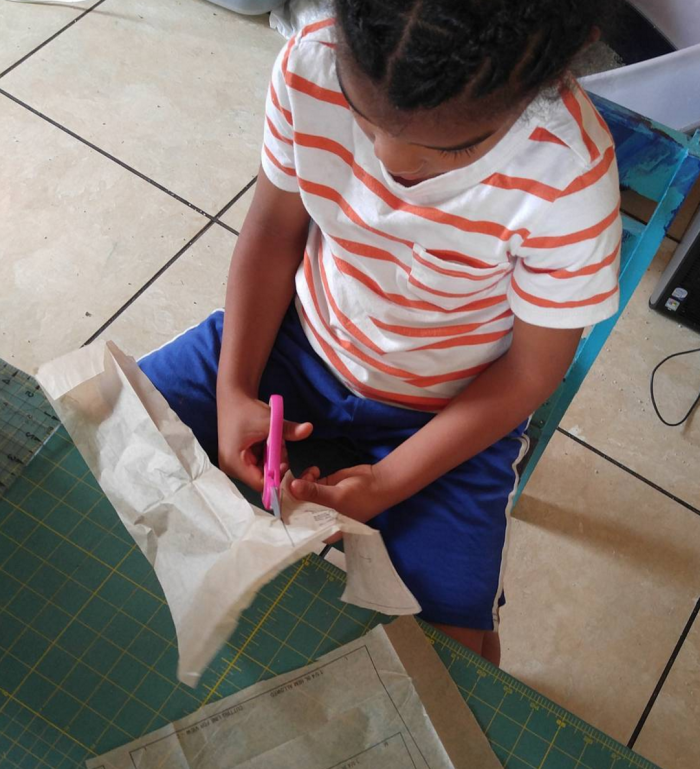 My son just turned 8 and I know he would love to do more sewing. Shorts are a great idea for a project… will have to try that! I just found your site, actually I have a request!!! I was given a Bernette Bernina identical to yours. 234 I believe. I have never played with one and could use all the help you can give. Threading. And suggestions for uses with a server. I too am very impressed by Juice. My grandaughter,Olive, will be lucky to learn to make potholders from me.??? ?